Home › Zimfest News Blog › Posts Tagged "University of Puget Sound"
Posts Tagged "University of Puget Sound"
If you will be arriving on Wednesday or any other day after 5 PM, please let us know your expected time of arrival by e-mailing gro.t1556024943sefmi1556024943z@gni1556024943suoh1556024943. Late arrivals will need to go to UPS Security Services at 3206 N. 15th St. to collect their room and dorm keys. Their office is located in a house on the SW corner of N. 15th St. and Alder St., right at the main entrance to campus. You may contact Security Services at 253-879-3311. There are kitchens in the ground floor of each dorm for those wanting to make coffee or store food in a fridge. The kitchens are not equipped with any pots and pans or cooking utensils however. The weather is supposed to heat up again by the weekend. Bring a fan, the dorms are not air conditioned! Looking forward to a wonderful three days of dance and music! Friday July 18th is the last day to drop Zimfest workshops. The deadline for signing up for Zimfest housing and meals has already passed, but there may be a limited number of rooms and meals available at onsite registration starting Thursday July 24. Are you aware of the Panel Discussion taking place at Zimfest Saturday July 26? The panel topic, “Implications and Ethics of an Online Zimbabwean Music Database,” is an offshoot of a rich exchange that took place in November 2013 on the Dandemutande.org email list. We encourage all members of the Zimfest community to attend this free special session, as it represents a unique opportunity to discuss some important issues together with our panelists in real time. There is no need to register for the Discussion as it will take place in the Schneebeck Concert Hall. For more information, see https://2014.zimfest.org/festival-events/. We are sorry to inform you that Julia Chigamba and the Chinyakare Dance Ensemble will not be with us this year. We will miss them and hope to have them at Zimfest in the next year or so. Zimfest is very lucky, however, that some old friends are in the area and will be available to take Chinyakare’s performance spot. We are happy to announce the return of Bongo Love to the Zimfest Stage! The group has added two new performers to their lineup and have been wowing audiences up and down the West Coast, so we look forward to having them. It is now less than two weeks before the start of Zimfest 2014, and we have had to cancel workshops with enrollments of less than two. Please check the webpage at https://2014.zimfest.org/news/ for a list of workshop changes and cancellations. Without Julia Chigamba, we have had to cancel the Mauya Mauya workshop—that will have to wait until Julia returns to Zimfest. The Dinhe Dance workshop she was going to teach is now in the capable hands (and feet) of Jimu Makurumbandi. If you were registered for a workshop that has been canceled, your account will be credited with the cost of the workshop. You may apply the credit towards another workshop. If you do not use the credit by the end of the festival, you may request a refund, or choose to donate the money to the Zimfest Association. A reminder about Prefest: Before Zimfest kicks off in earnest, there is time on Thursday July 24th between 9 AM and 3 PM to set up private lessons and workshops with teachers who will be onsite. A list of teachers available can be found here: https://2014.zimfest.org/festival-events/. Email us at gro.t1556024943sefmi1556024943z@sre1556024943hcaet1556024943 if you would like to set up a Prefest workshop. The 2014 Zimfest Concert Schedule has been posted on the website! An innovation this year is the introduction of featured lunchtime performances Friday through Sunday from 11:45 to 12:45 AM, scheduled so that there are no conflicts with workshops. Eat your lunch outside while enjoying some of your favorite groups: Yeukai Marimba from Boulder launches on Friday, Nhapitapi Mbira rocks out on Saturday and Kurai Mubaiwa and Friends entertains on Sunday. As always, the concert schedule is subject to change, so do not be surprised to see some adjustments in the lineups. As promised, we have some new workshop titles for you to choose from: by popular demand, Dr. Sheasby Matiure will be teaching Zimbabwean and Southern African choral and makwayera singing; new Zimfest teacher Jimu Makurumbandi offers muchongoyo dance and mbira singing techniques; and Mylinda King and Jesse Larson offer tasty new marimba tidbits! Check the News and Updates page for all workshop changes. Don’t delay registering for Zimfest: July 9 is the last day to purchase housing and meals, and we will start to cancel workshops with low enrollment on July 11. We are pleased to report that registrations for Zimfest 2014 are steadily increasing; the excitement is building! The good news this week is that our dear friend Dr. Sheasby Matiure has arrived in the U.S. We are still waiting to hear about the visa status for Selmor Mtukudzi however. The last date to register for and purchase a guaranteed room at the University of Puget Sound during Zimfest is June 23. Housing registration will remain open, and UPS will work with us to provide rooms registered for after this date, but cannot guarantee their availability. The last date to purchase UPS meals and rooms is July 9. You may be able to purchase meals at onsite registration, but UPS cannot guarantee their availability. Marketplace vendor applications are due June 30. See https://2014.zimfest.org/marketplace/ for information and applications. We are sad to hear that Erica Azim will not be coming to Zimfest 2014. Fortunately we have many excellent mbira instructors lined up for this year’s festival, and there are still plenty of interesting and fun workshops to choose from. Stay tuned for additions to the workshop schedule, as several marimba classes have already filled up. Pambile nga Masiko! Forward with the Past! Pamberi neChinyakare! We are pleased to announce that online registration for the 2014 Zimbabwean Music Festival is now open at https://2014.zimfest.org. We apologize for the delay, but think you will find it worth the wait! This year we are introducing the all-inclusive Zimfest PASS, which covers all festival costs including room, meals, concerts and workshops. Read about the PASS and other exciting new features at Zimfest 2014 at https://2014.zimfest.org/whats-new/. This notice applies to any person with disabilities who may be registering to attend Zimfest 2014 at the University of Puget Sound in Tacoma, WA this July. The federal Americans with Disabilities Act (ADA) of 1990 requires that persons with disabilities have equal opportunity to enjoy campus programs, activities, and benefits. The Zimfest 2014 Organizing Committee will work together with the University of Puget Sound to meet our responsibilities with respect to persons with disabilities. We will make every attempt to ensure that procedures are in place with respect to accommodating, and providing access to, Zimfest participants with disabilities. Zimfest must notify UPS of any special needs 60 days before the festival, so we are requesting individuals needing assistance or special accommodation (such as wheelchair accessible residences) to fully participate in the 2014 Zimbabwean Music Festival to contact gro.t1556024943sefmi1556024943z@noi1556024943tarts1556024943iger1556024943 by May 23, 2014. Zimfest organizers will in turn notify the University of Puget Sound of any requests. We hope to have registration live very soon at 2014.zimfest.org. 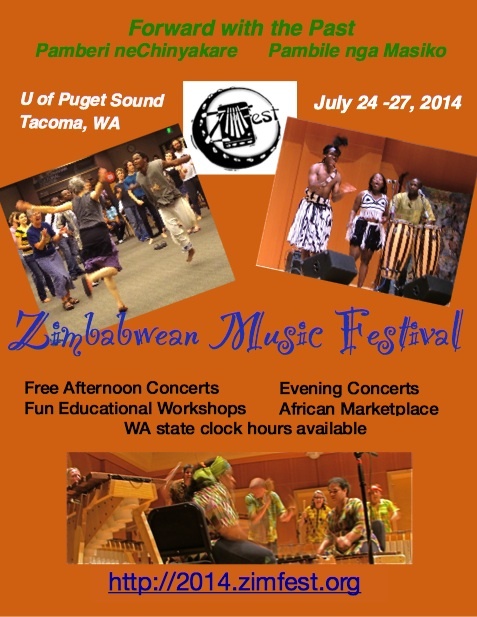 Please mark your calendars for the 2014 Zimbabwean Music Festival July 24-27th at the University of Puget Sound in Tacoma, WA. Thursday July 24th is Zimfest Pre-Fest with the opportunity to schedule private lessons during the day and the opening ceremony in the evening. On Friday the schedule starts in earnest with three days of workshops, afternoon and evening concerts and the African marketplace. These Zimfest 2014 “Save the Date” announcement cards will be coming out soon. Take note – continuing education clock hours will be available for Washington State teachers! I’m excited to be named the Festival Coordinator for the next Zimbabwean Music Festival (July 24-27, 2014), and I think you will enjoy the lovely campus of the University of Puget Sound in Tacoma! In consultation with Cosmas Magaya and Lucky Moyo, we have agreed on a theme for Zimfest 2014, inspired by a saying in chiShona from Ambuya Beauler Dyoko: Pamberi neChinyakare—meaning Forward with the Past/Tradition or Pambili nga Masiko (siNdebele). Sekuru Cosmas says the theme is perfect because we need to counter the attack on traditional practices from some of the Apostolic/Pentecostal Churches in Zimbabwe; Lucky agrees that it is a great statement and likes that it connects us with Ambuya. If you have small chunks of time, there are many other tasks that you can do leading up to (as well as at) the festival: publicity and marketing; festival guide article solicitation, proofreading, editing and production; website content proofing and updating; T-shirt production and sales; airport pickups/drop-offs.